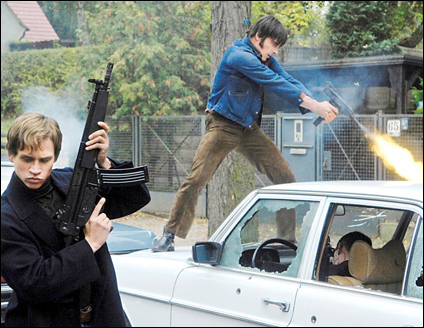 The Baader Meinhof Complex, German director Uli Edel's new film, is a fast-paced and unsentimental look back at 1970s West Germany, a time when the entire world was in turmoil; the Vietnam War raged on, and young, mostly white, and relatively privileged students in Western Europe were outraged by unfettered capitalism and imperialism. This was the post-war generation, the children of adults who may have been either tacitly or actively complicit with Nazi atrocities. For them, as the film explains in voiceover, a new era of freedom meant no tolerance for First World dominance and control of the under-classes. 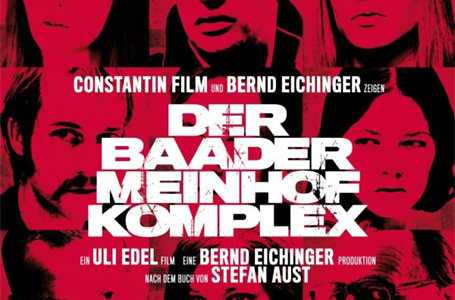 Based on a book by Stefan Aust, The Baader Meinhof Complex details the activities of the German RAF (Red Army Faction), a domestic terrorist group made up of idealistic, angry, and often callous young people who believed that the era's often symbolic words, to be taken seriously, should be backed by action and violence. 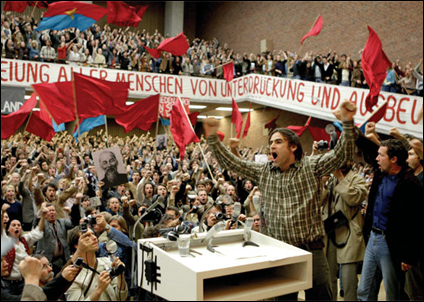 Andreas Baader (played by Moritz Bleibtreu, an actor who bares a passing resemblance to Gael Garcia Bernal), Gudrun Ensslin (Johanna Wokalek), and journalist Ulrike Meinhof (Martina Gedeck) were the leaders of the RAF. 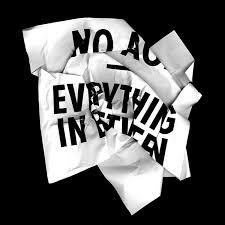 Their dogma was based on a loose collection of theories about justice, equality, repression, and oppression. While their actions were, like many activist and paramilitary groups of the time, rooted in relatively good intentions, the group was also a bit unfocused. 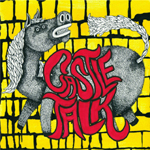 Still, in a short time the group managed to recruit a devoted following--helped along by a cocky indulgence in free love, fast cars, and marijuana. 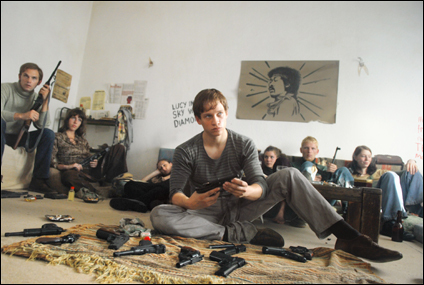 In the film, Meinhof is initially unsure as to whether she will be more effective writing articles for the left-wing magazine konkret or robbing banks armed with automatic weapons. Spurred on by Ensslin's digs that her journalism and passive activism engaged only in "theoretical masturbation," Meinhof acquiesces and forsakes her two children and bourgeois existence for a life crime. As the lines between righteousness and terror become more and more blurred, ultimately landing the trio in jail, and the results of their campaign begin to snowball into something completely out of their control. Before long the nascent foundations of German democracy are threatened even while the core leadership of the RAF remains imprisoned, revealing just how deep their influence was felt and their discontent shared. Edel directs The Baader Meinhof Complex frenetically but effectively. 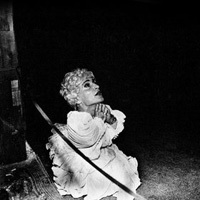 He stages the film's violent sequences--like a Berlin protest against the Shah of Iran and several shootouts--clearly and always filled with tension. He also rushes through various points in the timeline with the help of voiceover and montage, but this dubious tactic doesn't interrupt the storyline or take the viewer out of the proceedings. Given his background as a television director, the pacing makes sense: Edel knows how to get to the point flashily and quickly. Overall, this strategy sometimes makes the film feel a bit shallow and agitated, but given the 2.5-hour running time, it rarely drags. The characters are not always likeable, and at times the dialogue could stand to be more pedantic, but the actors are game for the task, especially Bleibtreu, who plays Baader with an enjoyable arrogance. The Baader Meinhof Complex details a fascinating and complex period of Germany history that few outside of Western Europe are familiar with. 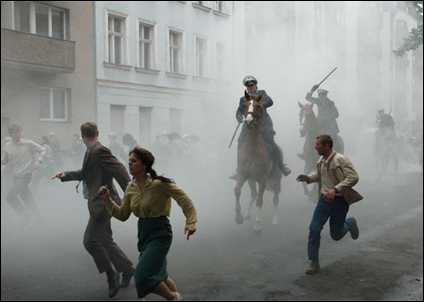 If the film can be treated as an historical document (the press release does take great pains to point out that the film was based as much as possible on eyewitness accounts and written texts), it seems Americans' post-9/11 panic doesn't hold a candle to what German society went through for almost a decade, with another bombing, shooting, and bank robbery just around the corner. In other words, Edel does a good job of translating the story to film, regardless of accuracy. And ultimately, that is where the success of the movie lies.